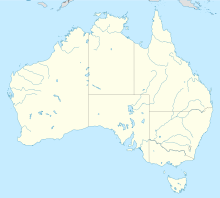 The Gorgon gas project is a natural gas project in Western Australia, involving the development of the Greater Gorgon gas fields, subsea gas-gathering infrastructure, and a liquefied natural gas (LNG) plant on Barrow Island. The project also includes a domestic gas component. Construction was completed in 2017. 'Greater Gorgon' refers to a grouping of several gas fields, including Gorgon, Chandon, Geryon, Orthrus, Maenad, Eurytion, Urania, Chrysaor, Dionysus, Jansz/Io, and West Tryal Rocks, situated in the Barrow sub-basin of the Carnarvon Basin. The Gorgon field is centered about 130 kilometres (81 mi) off the north-west coast of Western Australia, where the water depth is approximately 200 metres (660 ft). Other fields in the group lie to the north, such as Jansz-Io, which covers an area of 2,000 square kilometres (770 sq mi), in a water depth of 1,300 metres (4,300 ft). Barrow Island lies off the Pilbara coast, 85 kilometres (53 mi) north-north-east of Onslow and 140 kilometres (90 mi) west of Karratha. The largest of a group of islands which include the Montebello and Lowendal Islands, it is 25 kilometres (16 mi) long and 10 kilometres (6.2 mi) wide, covering 235 square kilometres (91 sq mi). More than 200 exploration wells have been drilled in the Barrow sub-basin over the past 35 years, including West Tryal Rocks in 1972, and Spar in 1976 - both discovered by West Australian Petroleum (WAPET) which had been a pioneering company in the development of the Western Australian petroleum industry. WAPET was the operator on behalf of various joint ventures comprising Chevron, Texaco, Shell and Ampolex (the exploration division of Ampol). Chevron and Texaco merged in 2001, Mobil took over Ampolex, and later merged with Exxon to form ExxonMobil. In 2000, Chevron became the operator of all WAPET's petroleum assets. WAPET discovered Gorgon in 1981 with the drilling of the Gorgon 1 well. Later discoveries included Chrysaor (1994) and Dionysus (1996). The Jansz-Io gas accumulation, discovered in January 2000, contains an estimated 566 billion cubic meters of recoverable reserves. The project received preliminary environmental approvals from the West Australian government in September 2007 and from the Federal Minister for the Environment in the following month. The project developers then submitted revised plans to cover an expansion in the size of the project. Final environmental approval was received from the state government on 11 August 2009. On 26 August 2009, the Federal Environment Minister announced that the expanded project on Barrow Island had been given conditional environmental approval. During the 2007 Australian federal election campaign, the Australian Labor Party announced that a future Labor government would set aside 25% of future Petroleum Resource Rent Tax from the Gorgon project to establish a Western Australian Infrastructure Fund. The Gorgon and Jansz-Io gas fields, 200 kilometres (120 mi) from the coast are said to contain 35.3 trillion cubic feet (1,000×10^9 m3) of natural gas and may have a lifespan of 60 years. Using initially 18 wells, gas will be delivered via subsea gathering systems and pipelines to the north-west coast of Barrow Island, then via an underground pipeline system to gas treatment and liquefaction facilities on the island's south-east coast. The plant will consist of 3 liquefied natural gas (LNG) trains, each capable of producing a nominal capacity of five million tonnes per annum (MTPA). LNG and condensate, initially stored in onshore tanks, will be offloaded from a 2100m jetty onto LNG carriers and oil tankers, for delivery to overseas customers. Natural gas for domestic use will be exported by a 70 km subsea pipeline to the mainland, for transmission to local customers. On the total investment of the Gorgon LNG project, media articles have reported analyst forecasts of estimated costs ranging from A$11 billion (in 2003), A$16 billion (2007), and A$50bn in March 2009 to A$43bn in Sept 2009 and A$53bn in 2015. ### The next line relates to the Wheatstone Project ###Chevron, however, mentioned in September 2011 that the foundation phase will cost about US$29bn and consists of two LNG processing trains with combined capacity of 8.9mtpa. LNG sales agreements have been reached between the joint venturers and customers in China, India, Japan and South Korea. Chevron Australia has executed Sale and Purchase Agreements (SPAs) with Osaka Gas (1.375Mtpa for 25 years and 1.25 percent equity in the Gorgon Project), Tokyo Gas (1.1Mtpa for 25 years and 1 percent equity), Chubu Electric Power (1.44Mtpa for 25 years and 0.417 percent equity in the Gorgon Project) and GS Caltex of South Korea (0.5Mtpa for 20 years from Gorgon and Chevron system gas). Chevron Australia also has Heads of Agreements with Korea Gas Corporation (KOGAS) (1.5Mtpa for 15 years); Nippon Oil Corporation (0.3 Mtpa for 15 years) and Kyushu Electric ( 0.3 Mtpa for 15 years). Shell has entered into long-term LNG sale and purchase agreements with PetroChina International Company Limited and BP Singapore Pte. Limited and also has secured capacity at LNG receiving terminals including the terminals at Energia Costa Azul LNG in Baja California, Mexico and Hazira in Gujarat, India. An Australian subsidiary of ExxonMobil has signed long-term sales and purchase agreements with Petronet LNG Limited of India and PetroChina International Company Limited for the supply of LNG from the Gorgon Project. The agreement with Petronet LNG is for the supply of approximately 1.5 Mtpa of LNG over a 20-year term while the agreement with PetroChina is for the supply of approximately 2.25 Mtpa over a 20-year term. Together, these two sales and purchase agreements commit the ExxonMobil subsidiary's share of LNG from the 15 Mtpa Gorgon LNG Project. Under the provisions of the Barrow Island Act (2003), the joint venturers are required to reserve 2000 petajoules of gas for delivery into the domestic market. The Gorgon Joint Venture announced plans to establish a domestic gas project, including plans for progressive expansion to enable delivery of 300 terajoules of gas per day into the domestic transmission system. Chevron have indicated that deliveries of Gorgon domestic gas will commence around the time of start-up of the third LNG train. ^ a b c d "Gorgon EIS 2009-Response to Submissions" (PDF). Chevron Australia. Retrieved 2009-08-20. ^ "Gorgon, Northern Carnarvon Basin". Offshore-technology.com. SPG Media Limited. Retrieved 2008-06-16. ^ a b "Offshore Acreage Release 2008:Exploration History". Department of Resources, Energy and Tourism. Archived from the original on 11 September 2009. Retrieved 20 August 2009. ^ "Chevron gets Gorgon green light". Upstream Online. NHST Media Group. 7 September 2007. (subscription required). Retrieved 2008-07-18. ^ "Chevron gets Gorgon green light". Upstream Online. NHST Media Group. 27 October 2007. (subscription required). Retrieved 2008-07-18. ^ "Final State environmental approval for Gorgon development". Government of Western Australia. Archived from the original on 25 September 2009. Retrieved 20 August 2009. ^ "Gorgon Expansion" (PDF). Federal Minister for the Environment, Heritage and the Arts. Retrieved 2009-08-26. ^ "anthonyalbanese.com.au". Archived from the original on 6 July 2011. Retrieved 21 August 2018. ^ "Gorgon To Drive Australian LNG Asia-Export Surge" (PDF). JPT. November 2010. Retrieved 2011-06-02. ^ "Project Overview" (PDF). Chevron Australia. Retrieved 2009-08-20. ^ a b Chambers, Matt (15 September 2009). "Stock Quotes". The Australian. ^ Projects: Gorgon Carbon Dioxide Injection Project Archived 9 May 2012 at the Wayback Machine, Global Carbon Capture and Storage Institute. Further details: Case study - Gorgon Carbon Dioxide Injection Project, The Global Status of CCS: 2011, Global Carbon Capture and Storage Institute. ^ Milne, Peter (2017-12-19). "Carbon hiccup for Chevron with 5 million-tonne greenhouse gas problem at Gorgon LNG plant". The West Australian. Retrieved 23 January 2018. ^ "Shell inks Gorgon LNG deal with PetroChina". Sydney Morning Herald. 4 September 2007. Retrieved 2009-08-27. ^ Sainsbury, Michael (19 August 2009). "Australia signs $50bn gas deal with China". The Australian. Archived from the original on 20 August 2009. Retrieved 20 August 2009. ^ a b "Gorgon-Revised Public Environmental Review" (PDF). Chevron Australia. Retrieved 2009-08-20. ^ "Domestic Gas" (PDF). Chevron Australia. Retrieved 2009-08-20. ^ "Project Newsletter Oct08" (PDF). Chevron Australia. Retrieved 2009-08-29. ^ "Current Threatened and Priority Fauna Rankings February 2009". Department of Environment and Conservation. Archived from the original on 1 August 2009. Retrieved 29 August 2009. ^ "Barrow pipeline adds to protesters woes". Upstream Online. NHST Media Group. 11 December 2007. (subscription required). Retrieved 2008-07-18. ^ "Gorgon gas project 'environmental vandalism'". Australian Broadcasting Corporation. Retrieved 2009-08-27. ^ "Threatened animals suffer for gas project". Perthnow. Retrieved 13 June 2012. This page was last edited on 4 November 2018, at 02:09 (UTC).